But Does The Seed Sprout? In today’s Gospel, Jesus was at the seashore and was teaching his disciples. However, a large crowd of people began to gather around Jesus. The crowd grew so large that Jesus got into a boat and began to teach the people from the boat. 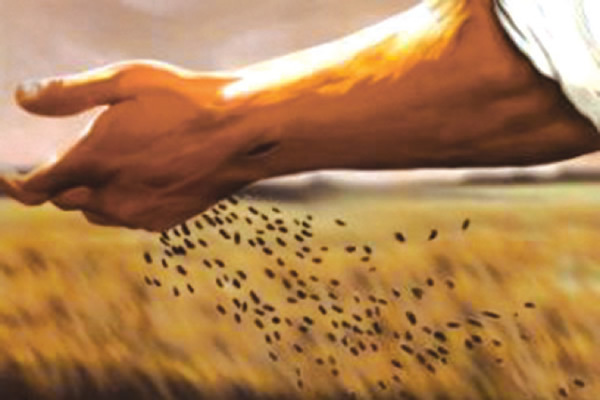 One of the parables is very familiar to us: the parable of the sower and the seed. As we know, some of seed fell on the path and the birds swooped down and ate the seeds. Other seeds fell on rocky ground. And although these seeds sprouted quickly, soon the plants withered since the roots were not being nourished by the soil. Then there was the seed that fell on good ground. These seeds sprouted and eventually produced an abundant crop. The parable can stir many questions within us. How do I receive Jesus’ word? Is the soil of my heart rocky? Does the soil of my heart allow Jesus’ word to settle into depths of my soul or do I only listen to Jesus’ word and stay on a superficial level with it? Do I strive to internalize the word that Jesus speaks to me? Do I sit patiently and quietly with Jesus until I am able to hear his word? It is easy to read the Gospel. However, to pray with the Gospel requires time, attention, and an open heart. Today will we simply “read” the Gospel or will we take Jesus’ words to heart and ponder them? It is our choice! Lord, thank you for showing me how to bear fruit in my life. I want to imitate your surrender to the Father. I know that this requires a constant effort to go deeper in my life and be submissive to the Holy Spirit. Help me to live as a giver, not a taker. Your love will always be there to accompany me. This week may the Word take root in our lives. If we allow it to penetrate beneath the surface, we will begin to find ourselves, and find the areas of ourselves which seemed lost or broken, abandoned or forgotten, “unplugged” or “turned off” to the transforming power of God.